Can You Drink Non-Alcoholic Beer While on Antabuse? If you are taking Antabuse (disulfiram), will you have a reaction if you drink non-alcoholic beer? You should avoid non-alcoholic beer when you are taking this medication, for more than one reason. First of all, non-alcoholic beer (NA beer) is not really totally free of alcohol. You will see it called "near beer" or 'low-alcohol beer." Typically, most brands of non-alcoholic beer on the market today contain about 0.5 percent alcohol. Antabuse is designed to cause anyone who drinks alcohol while taking it severe discomfort. By interfering with the normal metabolic process of the alcohol, Antabuse can cause a wide range of symptoms from mild to very severe. Typically, anyone who drinks even a small amount of alcohol while taking Antabuse will experience nausea almost immediately. Antabuse is so sensitive to any intake of alcohol, people have reported having reactions even after rinsing with mouthwash or using an aftershave containing alcohol. 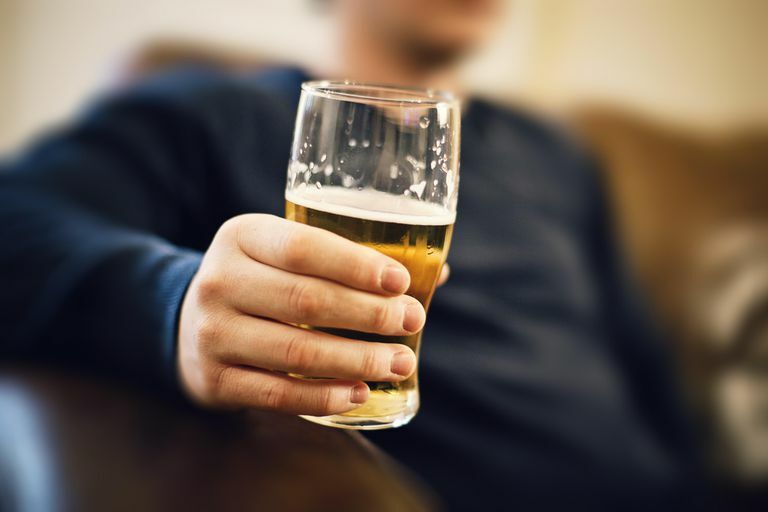 Drinking non-alcoholic beer can trigger a craving for alcohol in people who have an alcohol problem. The smell of the beer is especially a powerful trigger. If a person is struggling to maintain sobriety, this is a stimulation they should avoid. The small amount of alcohol in the near beer may be a problem as well in encouraging a relapse. Another factor is the social situation in which you drink the non-alcoholic beer. If you are socializing with friends who were your drinking buddies and they are drinking alcohol, it may be difficult to remain sober. To maintain your sobriety, most experts recommend breaking those patterns and staying out of that social situation. How might you react if your friends challenge you to have a sip of "real beer" or ridicule your choice of a non-alcoholic drink? One problem that family members face in trying to support their alcoholic relatives is that often they cannot respond to the actual circumstances because they are not being told the truth. One woman relates that her husband stopped drinking after a traffic crash and was using Antabuse to enforce his sobriety. However, he began drinking non-alcoholic beer. Soon, he was returning home appearing to have drunk alcohol but without the physical effects that Antabuse should produce. For friends and family members dealing with the sometimes confusing and frustrating behavior of an alcoholic or an addict, help, and support is available in Al-Anon Family Groups from others who are or have been in similar circumstances. Antabuse—(Diethylthiocarbamoyl Disulfide). New York State Office of Alcoholism and Substance Abuse Services. Smells May Trigger Alcohol Craving, and Relapse, Among Alcoholics. Addiction Technology Transfer Center Network. Are You Able to Control Your Alcohol Consumption?